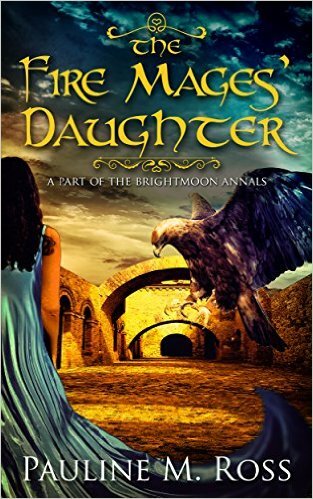 After reading The Fire Mages at the end of last year, I was eager to read more from Pauline M Ross, and I picked for my next read the sequel to that one, starring as its protagonist Kyra’s daughter, Drina. Drina is a rather sickly girl with a strong attachment to her mother, so when she is summoned by the Drashona (equivalent to a queen) who wishes to assess whether she would make a suitable heir, Drina isn’t too happy about it. Drina finds herself trained as a diplomat, and in this role meets with the new living god of the Blood Clans – a mysterious people possessing a strange and threatening type of magic. When Bennamore goes to war with the Blood Clans, Drina must protect those she cares about and see through the complications to bring about peace. Anyone who has read my review of its predecessor will be unsurprised to find I consumed The Fire Mages’ Daughter very quickly. This is one I read in only two days – probably the quickest I’ve read a novel in several years. Ross writes with strong pacing and a frankness that makes her stories easy reading, without compromise to depth. In Drina we have a similar sort of protagonist to Kyra – on the surface, at least. Drina is strong-willed and smart, but also young and inexperienced, with little idea of what her place is in the world. She’s a brilliantly well-rounded character – with blind spots and flaws, weaknesses. Drina is capable of great intelligence, and also great naiveté. In her love life, she makes rationalisations and allows herself to be lied to when it means she gets what she wants – risking future heartbreak in favour of current happiness. In this certainly I can recognise her humanity, even if it is harder to see parallels as she struggles with the role magic plays in her life. The plot is masterfully crafted, unpredictable but with clear cause and effect to be seen in hindsight. It is full of action, drama and intrigue, well-balanced such that there is never too much of one mood or approach before advances in the plot move things onwards. In my review of The Fire Mages, one of my criticisms was the use of several invented terms. In The Fire Mages’ Daughter, many if not all of these terms are used, but I didn’t notice them as much. This might be because I already knew them from the earlier book, and so for a new reader picking up this book without having read its predecessor it may be off-putting, but for an existing reader it’s not such a drawback. And while I am happy to forgive titles such as “Drashona” for a queen in a political system that doesn’t quite map to real-world monarchies, or “drusse” for a sort of official contracted concubine role which again has no equivalent, I would have prefered normal words used for concepts which do exist, like day and month, for better clarity and because substitutions in these cases are unnecessary. One thing I do like about The Fire Mages’ Daughter is the overall positive outlook. There is an optomism to Ross’s writing that stands in contrast to the recent trend towards darker, more threatening themes, what is refered to as “grimdark”. Even though there are dark forces at work in the world of Bennamore, and evil people with sinister, even shocking goals, Ross does not indulge in the negativity that such events and themes might invite. It is a refreshing and uplifting approach. I rate The Fire Mages’ Daughter 9.5/10. In all respects bar the unnecessary vocabulary substitutions it is a fantastic read.